The Jawa 300 is available in 1 variant and three colors. 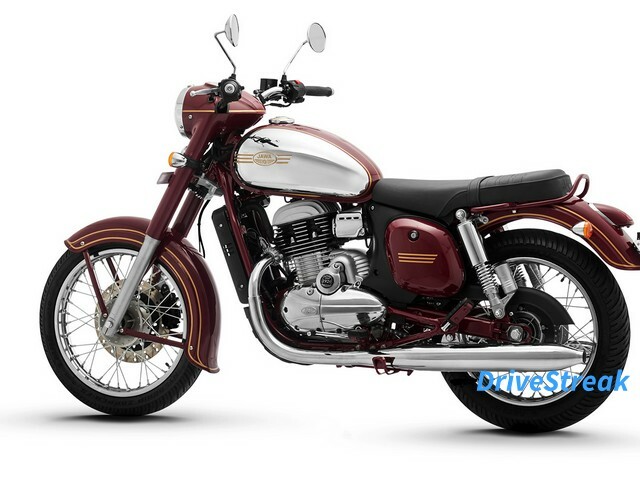 Check out Jawa 300 prices, specifications, colors, features and mileage. Our detailed Jawa 300 comparison helps you compare the bike with its competitors. DriveStreak brings you all the information about Jawa 300 to help you make the right buying decision. The Jawa brand is back in the reckoning with the launch of two new bikes – the Jawa Standard and the Jawa Forty two. The bike is a timeless classic and exact;y resembles the Jawa of yesteryear’s, With its polished chrome, round headlight, chic curves, you`ll instantly fall in love with the bike. The Jawa 300 price starts at Rs. 1.64 lacs. The Jawa brand is back in the reckoning with the launch of two new bikes – the Jawa Standard and the Jawa Forty two. Powering the Jawa Standard is a 293cc liquid cooled single cylinder motor that develops 27 bhp and 29 Nm of torque. The bike is BSVI compliant and the company claims that the motorcycle offers a good mid-range and performance is on par with bikes in its segment.